Eugene Charles Tryon was born in Montevideo, Minnesota, on June 11, 1921, to Loretta and Clarence Eugene Tryon. He passed away peacefully at home in Safford, Arizona on July 20, 2018. Eugene was baptized on July 10, 1921. He has one surviving brother, Robert Leo Tryon of Minneapolis, Minnesota. Eugene was preceded in death by his grandparents Eugene and Martha Tryon, his parents Clarence and Loretta Tryon, and two sisters Elizabeth (Betty) Lou Tryon and Mary Lorraine Tryon Aker. Eugene began his career with the Milwaukee Railroad in 1941. 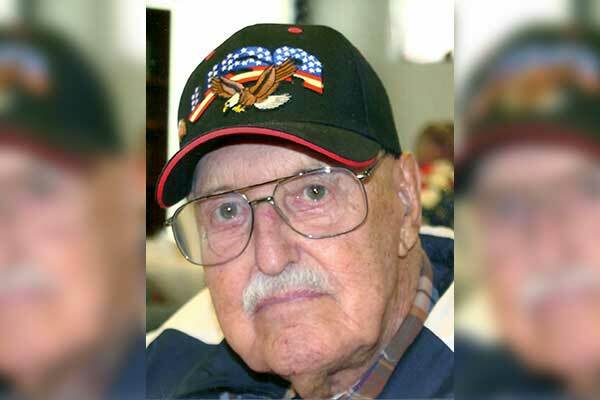 He then enlisted in the Army in 1942, and he served in the 1339th Engineers Construction Battalion as a heavy-duty truck driver while serving overseas on the European and Central Pacific Theatre of Operation and in Canada during World War II. He was honorably discharged in 1946. Eugene returned to the Milwaukee Railroad as a switchman in 1946 and retired after nearly 36 years in 1981. Upon retirement, Eugene moved to Yucca Valley, California. In December2013, he moved to Safford, Arizona. Eugene married Inez Elvera Neslund from Montevideo, Minnesota, on April 2, 1949 in Worth County, Iowa. Inez passed away on August 16, 1991 in Yucca Valley, California. On September 7, 1992, he married Elinor Louise Hutchinson of Twenty-Nine Palms, California. Elinor passed away on June 14, 2017, in Safford, Arizona. Eugene was a devout Seventh Day Adventist who attended church weekly up to his death. He was a member of the American Legion-Solomon Chapter, he loved to play cards with family, go to the Senior Center weekly, spend time with loved ones, and watch baseball. He leaves behind his brother, Robert Leo Tryon of Minneapolis, Minnesota, and numerous family members, extended family, and friends. Funeral Services will be held September 3, 2018, at 10 a.m., at the Seventh Day Adventist Church in Safford, Arizona. A Celebration of Life will be held on September 29, 2018 at the Rivers Restaurant in Montevideo, Minnesota. Interment Services will be held October 10, 2018 at 11:30 a.m., at the National Cemetery in Riverside, California.